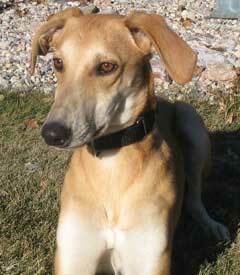 Carter is a very lovable pup who has adjusted extremely well to his new life. He has quickly learned the rules of living indoors.He is very smart and will definitely train well. Carter is very respectful of his environment and lets you know when he needs to go outside and do his business-house trained already!! He does stairs up and down, crates well and usually sleeps the night-pretty impressive for a pup! He travels very well & loves his van rides. A very playful pup who loves his toys especially squeaky ones, a great fetcher…you through it and he gets its. Carter’s favorite activity is playing in the backyard, especially in the snow. Carter is a very easy going pup who adjusts to any situation from cuddling on the couch, lying on your lap to hanging out in the garage. 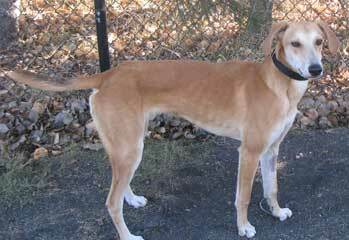 He is very independent and would do well as an only dog yet he socializes well with our other greyhound. Very gentle as he wakes them up in the morning.